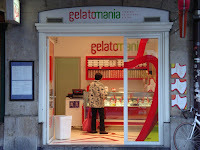 One of the things that we noticed when we moved to Geneva is that the Swiss are very child-friendly. It is a great place to raise a family. Children are a part of everyday life here and are welcomed almost everywhere. You can go into even the most exclusive restaurant with your children and they will be greeted with a friendly smile. Even going for a meal in the evening is no problem. 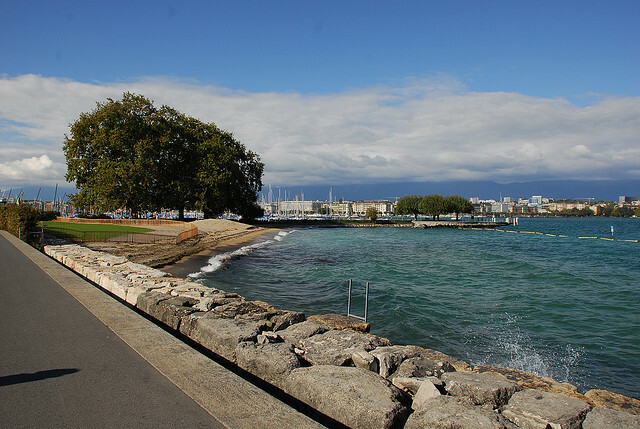 If you are planning a short trip to Geneva this walk will take you around the main attractions of Geneva without boring the children. Geneva is full of parks. Take a walk around the town, taking in the most important sights and stop for a break in the many parks and playgrounds around the town. 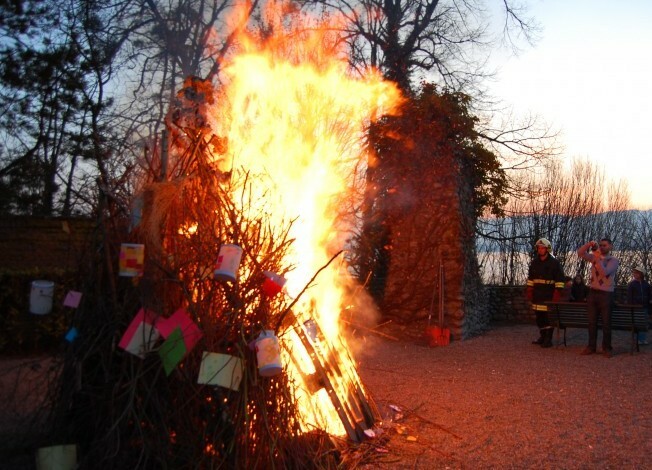 When we go into town, we park near the Parc des Eaux Vives, wander through the rose garden then up to the children’s play area in the Parc de la Grange to let them run off some steam. The play area is quite large, with several slides, ladders and bridges between them. It is suitable for all ages. There is a small cafe nearby that is open in summer, or you can take a picnic. Next to the play area is a public WC. 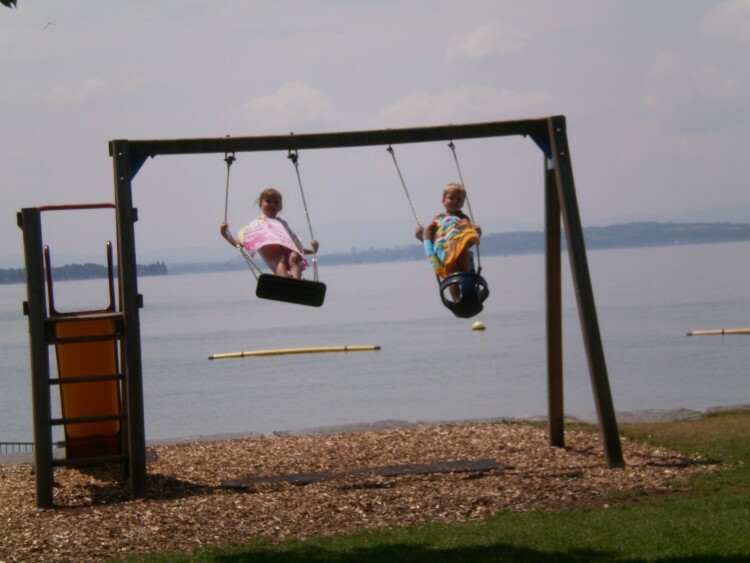 After a while you can gather the children up and walk back down to the lakeside, enjoying the views of the lake that you have from this slightly elevated position. When you get down to the lake, turn left towards the town. You won’t get far though, because opposite the park is a incredible play park on a small beach – Baby Plage. 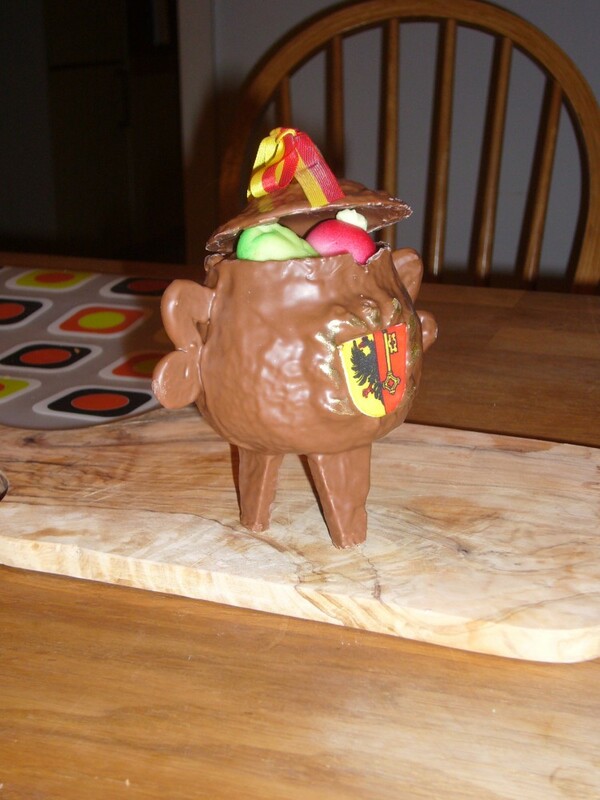 This is fantastic for slightly older children. It is a slightly surreal looking play park – the trees are festooned with bicycle tyres and tubes, knotted together to make a climbing frame and swings. This is the favourite park of our children, and the small summertime cafe right next to it means that parents can linger over coffee and enjoy the view. You may already be sensing a theme – the best parks have both a cafe and a loo. The public WC at Baby Plage is a bit grotty so hold your nose and take some tissues – it is a “French” hole in the ground one, although there is one sit down toilet for those who have not yet mastered the squat and pee position. 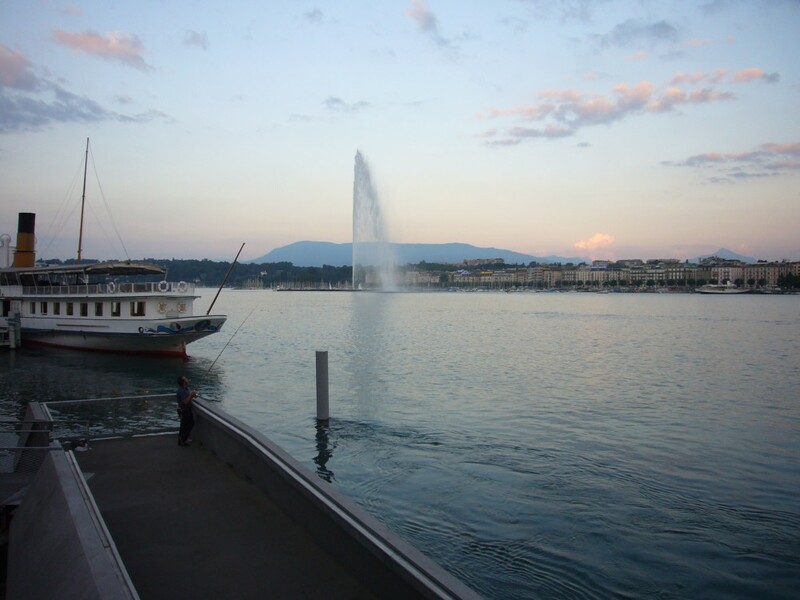 Moving on to more pleasant topics, as we wander on along the lake side to the Jet d’Eau, Geneva’s landmark fountain. Walk out along the pier, watching out for change in wind direction as you can get very wet. 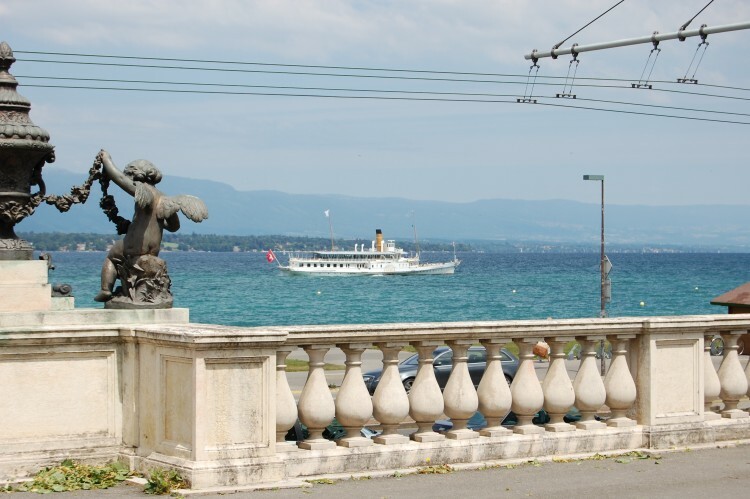 In late July to early August the lakefront is transformed into a massive fairground for the Féte de Genéve – if you are lucky enough to be here the opening weekend you can catch the air show. 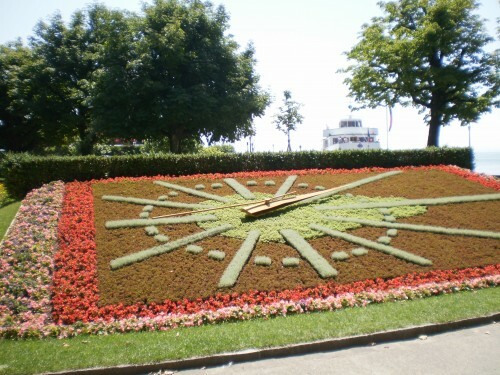 Don’t miss the famous clock made of flowers on the waterfront. If you have time, take at short trip across the lake and back on one of the little yellow water taxis. 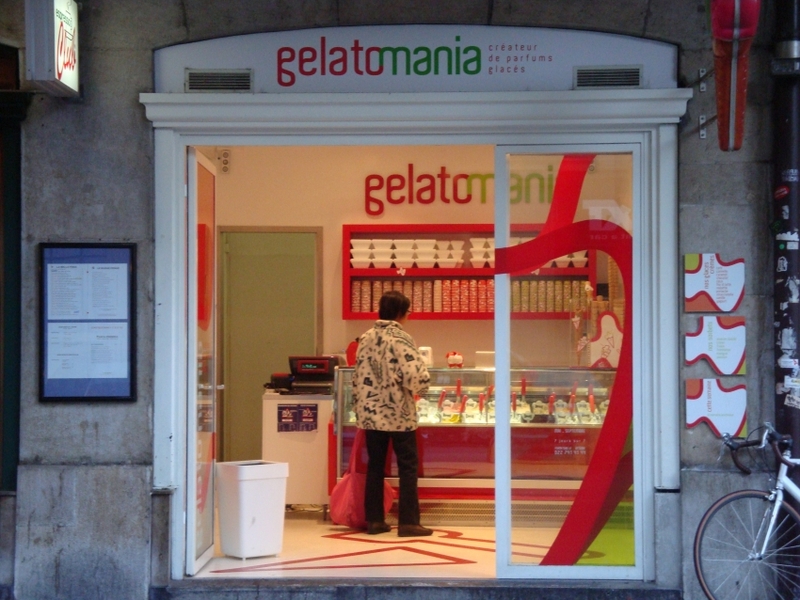 There are several ice cream parlours along the lakeside but the best ice cream is just a short walk away in Gelato Mania in Eaux Vives. 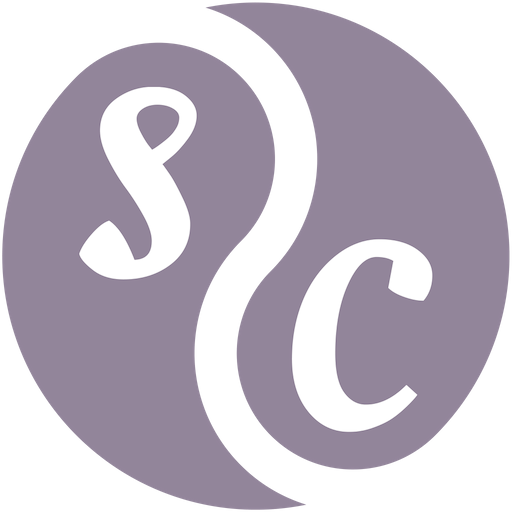 Don’t forget to try Caramel Fleur de Sel! 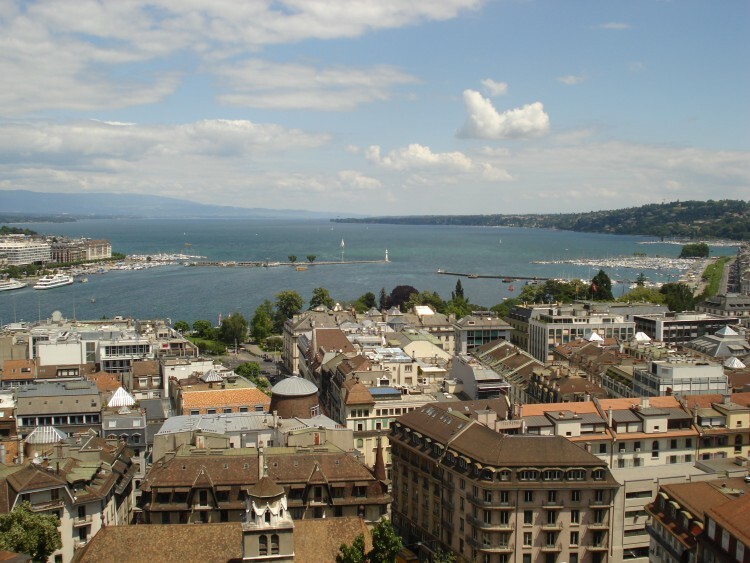 If you are in Geneva on Wednesday or Saturday before 1pm, make sure you have a look at the farmers’ market at Rive – on other days there is the indoor market, Halle de Rive for fresh fruit, fish and baked goods. 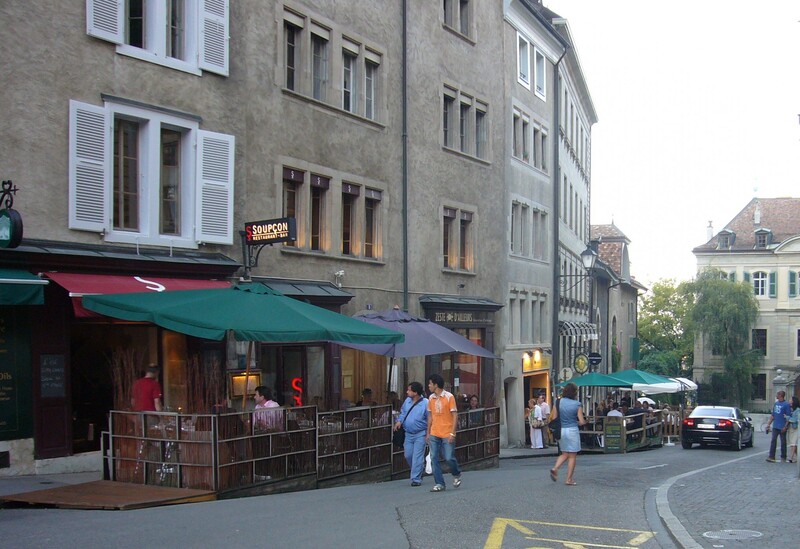 Head into towards the town centre, along the main shopping street to the Rue de la Confederation. A great place to have lunch is Globus, at Place du Molard where you can have a panini or some tapas, a bowl of soup or – our favourite – chicken sweet and sour with rice. Or just a coffee and delicious cake or pastry. 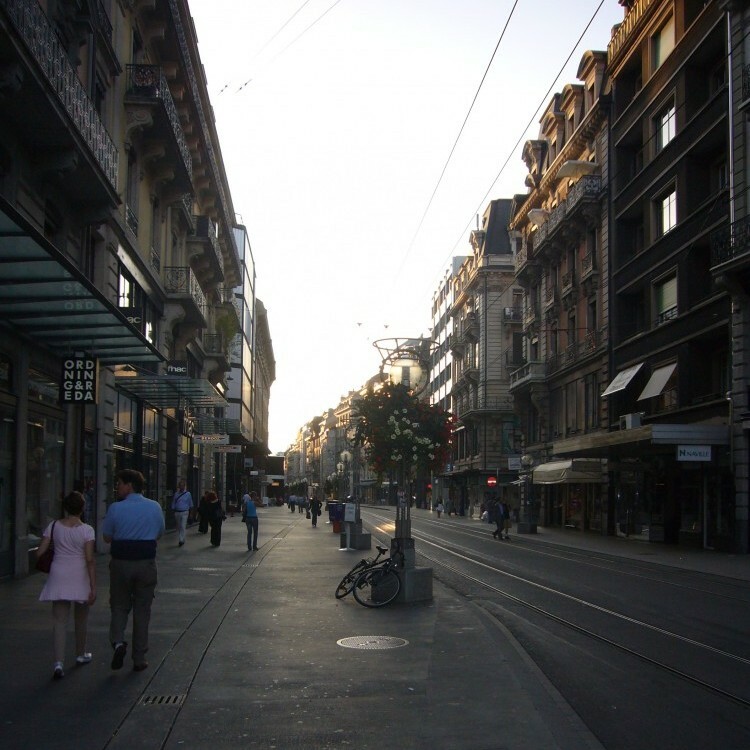 At the end of the main shopping street turn left along the Rue du Stand where the Swiss and Genevan flags line the beautiful old boulevard. 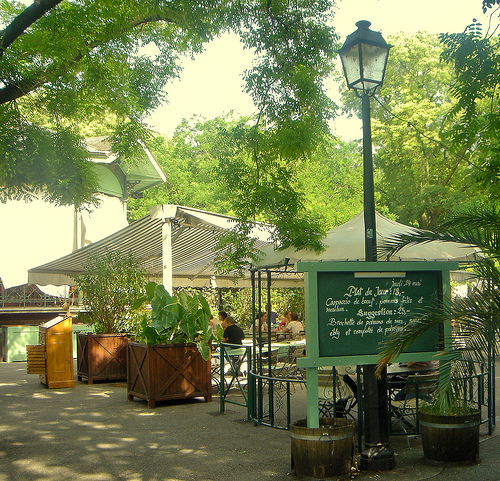 At the other end of the Rue du Stand you will find the Parc de Bastion which is well loved by young and old. There is a small shady play area here, with a sand pit. It is a good place for younger children and toddlers, with a cafe nearby. In winter there is a skating rink here, which is absolutely delightful. Your walk continues through the park, past the Reformation Wall. At the end of the park there is a steep slope up to the old town to the longest bench in the world. Another small play area keeps the children amused while you look down over the Parc de Bastion and over towards the Saleve mountain. Around the corner is the Hôtel de Ville – don’t miss the opportunity to check out the cannons here, always a big hit with the kids. Keep the Hôtel de Ville on your right, walk down to the Hotel des Armures, and turn right towards the Cathédrale Saint-Pierre. If you are still feeling fit, you can climb the 157 steps to the top of the north tower of the cathedral for a fantastic view of the town. From the Cathedral wander back up to the Rue de Hôtel de Ville, turn left and head for the charming Place du bourg-de-four. In the restaurant Chez ma cousin you can eat roast chicken at a very reasonable price – delicious, fast and great value food. Nowhere else in Geneva can you feed a family so inexpensively. Be prepared to wait a while for a table if you go after 8pm, or reserve a table. By now, you are tired and ready to go back to your hotel, pretty sure that the children will sleep well tonight!